Suzanne Slade loves finding out how things work. A former mechanical engineer, she once worked on Delta IV rockets and automotive brake systems. Now a full-time author, she has written more than one hundred children's books, including Friends for Freedom: The Story of Susan B. Anthony & Frederick Douglass and The House That George Built. Suzanne lives near Chicago, where she writes from home on her favorite invention—a laptop computer. Jennifer Black Reinhardt is fascinated by the stories behind old objects. While researching this book, she studied the Victorian clothing and furnishings in her collection of antique photographs--and fell in love with fancy borders. Jennifer is the illustrator of Rabbi Benjamin's Buttons and The Adventures of a South Pole Pig (Houghton Mifflin Harcourt). She could not have illustrated this book without the invention of the lightbulb. What would a renowned, established inventor have to say to a hopeful young tinkerer? Slade precedes her description of a historical meeting with interwoven accounts: one of Thomas, a disaster-prone experimenter who parlays an early interest in gadgets and electricity into a pen that produces multiple copies, a phonograph, and hundreds of other popular innovations; the other of Henry, born 16 years later, whose yen to produce a practical, inexpensive motor car encounters obstacle after frustrating obstacle. At last, hoping for insight into Edison's success, Henry buttonholes the great inventor at an 1896 dinner. The two instantly fall into a technical discussion, climaxed by the excited Edison's "Keep at it!" . . . the author and illustrator close with fuller notes on major Edison-ian inventions, the development of the Model T, and particularly the lifelong friendship that the encounter kindled between these two giants of industrial technology. . . .
"What's his secret?" That's the question dogging Henry Ford as he watches Thomas Edison's phonograph and incandescent bulb take off, while his own attempts to create steam and gas engines sputter. Slade shifts between the developing careers of both men until, while discussing engines with Edison at a dinner in 1896, Ford gets his answer: "Keep at it!" Edison shouts encouragingly. Reinhardt's mixed-media artwork includes several lighthearted moments (parallel scenes featuring Edison and Ford as children highlight the explosive results of early failed experiments). Extensive endnotes discuss Slade's and Reinhardt's processes and several of the inventions mentioned, along with a time line and source notes. It's a rewarding look at the importance of persistence, as well as the friendship that developed between these prominent inventors. Emphasizing the power of perseverance, this cheery picture book alternates between the lives of two inventors, beginning with Thomas Edison, who was 16 years Henry Ford’s senior. Many of Edison’s major inventions are touched on, and young Ford is portrayed as curious as to the secret of Edison’s success. Ford continues to work on developing engines and designing cars and finally seizes the opportunity to meet Edison in person. The two go over Ford’s designs, and Edison urges the younger man to “keep at it!” With that, Ford discovers that “he’d known Thomas’s secret all along!”—a realization illustrated with a light bulb over Ford’s head. The rest of the story focuses on Ford’s work on creating a car for all Americans, which resulted in the Model-T. Fanciful watercolor sketches depict Edison and Ford dreaming, inventing, and working, with a variety of expressions on their faces. The drawings are framed on the page, providing an old-fashioned feel. Inset images provide details and information on their inventions. The front and endpapers are filled with sketches of various light bulbs and gears in muted brown tones. The early lives and activities of these men are covered briefly. The factual text emphasizes how both started as dreamers who took action. Back matter includes a section on Edison and Ford’s friendship, more material about the inventions, author and illustrator notes, and extensive source notes with citations for dialogue and other facts. VERDICT A suitable addition for those seeking biographies of inventors. This dual picture-book biography of how Thomas Edison inspired Henry Ford succeeds in showing the emotional side of the life of an inventor: success requires more than just one or two—or even two dozen—attempts. Reinhardt’s soft, amiable watercolor, ink, and colored-pencil artwork provides a lot of visual detail about both Edison’s and Ford’s passions, while Slade’s text explains each man’s inspiration and the way his inventions fundamentally changed the world. 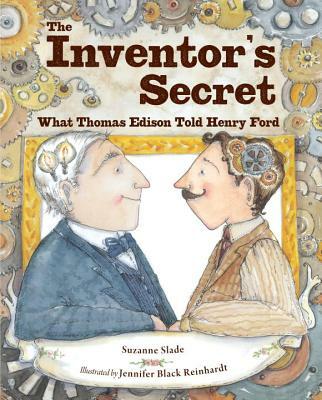 Ample source notes and a comprehensive dual time line help explain some of Slade and Reinhardt’s depictions of Ford and Edison, and photo-illustrated notes about each inventor’s most memorable creations provide substantial information to get kids started on research projects. While there are abundant compilations for kids about inventions and inventors, Slade and Reinhardt keep the focus solidly on the human element of frustration, persistence, and the power of a mentor. It’s an unusual angle and well executed, which makes it a good fit for STEM-oriented programs as well as storytimes about the benefit of good friendships.